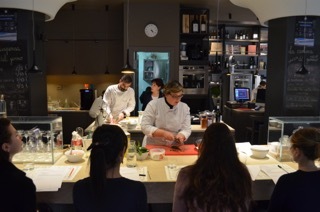 For private individuals, I'm willing to organize cooking lessons in Rome and everywhere in Italy, is at home both in my home (for up to 4 people to ensure a successful lesson). You can also contact me if you want me to cook for you at home, agreeing costs and menu. You can also contact me for cooking class and team building events. For companies, You can contact me if you are interested in serious and qualified cooperation with my blog, If you would like to advertise on my blog or if you want to call me to show cooking, demonstrations or cooking class in any Italian city. For restaurants, are available to cook in evening activities and to provide a consulting and elaboration of menus or to organize evenings for courses, tastings, cocktails or dinners. hello your review of a travelling in SE Sicily = ” Known, Scicli and Modica, itinerary in the heart of the Sicilian baroque” has some translations that obscure the article – and in some cases, just do not make sense. I am assuming that you used ‘google translate’ or similar. I would advise you to look at it again and try to make a better translation. Hello – I am trying to subscribe so that I can receive free emails with updates on your recipes. Each time I enter my email address and press subscribe it is rejected, why am I having this problem. hello, now I try to join you, let’s see if you get the email so you can subscribe membership.